New data from the Center for Effective Lawmaking show that Democratic Sen. Joe Donnelly of Indiana was the least effective member of his party at advancing agenda items toward becoming law during the last Congress. The study, done jointly by professors at the University of Virginia and Vanderbilt University, calculated Legislative Effectiveness Scores for each member of the Senate during the 114th Congress, which spanned from 2015 to 2016, and found Donnelly to be the least effective member of his party. The center, which has calculated effectiveness scores for each lawmaker stretching back to 1973 and earned bipartisan praise for its research, scores members based on 15 "indicators of effectiveness" such as the number of bills that were sponsored and how far those bills progressed toward becoming law. Bills are weighted based on importance, with "commemorative" bills counting least and "significant" bills counting most. Effectiveness scores are then adjusted based on factors that impact effectiveness, such as seniority of the member and whether he or she is in the majority. Ultimately, it is determined whether each lawmaker's effectiveness meets expectations, exceeds expectations, or is below expectations. Donnelly's effectiveness, unsurprisingly, was determined to be below expectations. During the 114th Congress, Donnelly introduced fewer bills than any of his Democratic colleagues. Only two of them received any "action in committee" and none advanced through committee, based on figures used by the center. This was not an aberration, according to the center. 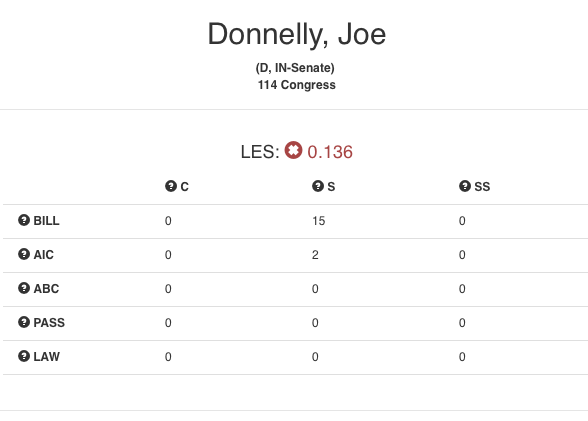 Donnelly was ranked 55 out of 57 in his party during the 113th Congress, his first as a member of the Senate, during which Democrats held the majority. Members are only ranked against colleagues in the same party to discount for the obvious boost in effectiveness that being a member of the majority party causes, according to study author Alan Wiseman, a professor at Vanderbilt University. "Ranking within just the party seemed more sensible than talking about where somebody was in the chamber overall," Wiseman explained. "If we just lobbed the entire chamber together, almost every member of the minority party would be at the bottom of the ranking." Wiseman points out that having a low Legislative Effectiveness Score doesn't necessarily mean someone is not an effective lawmaker because the score can't take into account work done behind the scenes to help advance legislation or even work done to block legislation that a lawmaker may oppose. A spokesman for Donnelly did not respond to a request for comment on whether this was the case. 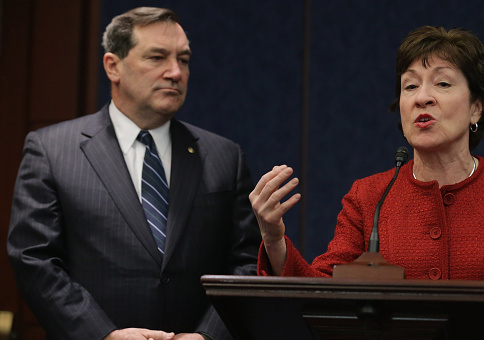 Donnelly, facing reelection in 2018, is considered to be one of the most vulnerable members of the Senate. This entry was posted in Politics and tagged Indiana, Joe Donnelly, Senate Democrats. Bookmark the permalink.